You are here: Home › Bento School Lunches › Re-Play Feeding Set Review & Giveaway! Re-Play Feeding Set Review & Giveaway! If you all haven’t check out my recent video on my Toddler meal ideas I will link it down below. In that video we featured our favortite Re-Play feeding products! I want to buy new feeding items for my two year old. When I saw Re-Play on my walmart shopping trip I was intrigued by all the awesome colorful options they have,I also wanted something really durable and I can say these plates are just that! Specially when my angry Toddler throws them when she’s done eating. I will highly recommend these plates,bowls,snack cups and utensil to any mommy looking for great afforable feeding sets. 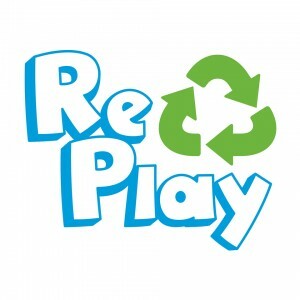 Also check out this cute video explaining how Re-Play Plates are made! 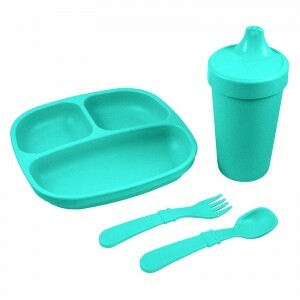 Don’t forget to entry my giveaway sponsored by Re-Play for a chance to win this beautiful Teal Feeding set! Follow the rafflecopter detail down below! 15 Responses to "Re-Play Feeding Set Review & Giveaway!" I am very interested in trying these for my 2 year old. I love how deep the sections are on the plate. My princess loves pizza, fries, oranges and spaghetti. My daughters favorite food is chicken strips and bananas!! Thanks for the opportunity to try out these items . My daughter is two years old and is just recently starting to eat very well ! She loves to eat broccoli , Tortillas , frijoles lol .